British troops have transferred control of Basra province to the Iraqi authorities, four-and-a-half years after the invasion. The handover marks a significant milestone towards Britain's final withdrawal from southern Iraq. Maj Gen Graham Binns, who led British troops into the city in 2003, said it had "begun to regain its strength". 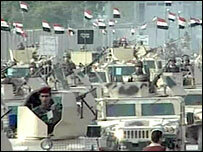 Iraq's National Security Adviser, Dr Mowaffak al-Rubaie, said the "historic" day marked a "victory for Iraq". In a ceremony at Basra airport shortly after 0800 GMT on Sunday, British and Iraqi representatives signed a memorandum of understanding to formalise the handover. Foreign Secretary David Miliband, who was present, said Britain would remain a "committed friend" to Iraq. "Our aim is to see an Iraq run by Iraqis for all Iraqis," he said. 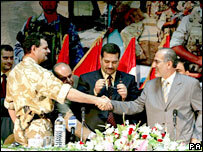 Dr al-Rubaie thanked British troops for their role in protecting the city from insurgents, retraining Iraqi soldiers and rebuilding the economy. He also praised the "sacrifices" made by the people of Basra. "This means a victory for Iraq and a defeat for its enemies," he said. Maj Gen Binns said Iraqi security forces had proved they were ready to take over. "I came to rid Basra of its enemies and I now formally hand Basra back to its friends," he added. The 4,500 British troops still in Iraq will now take a backseat role, focusing on training Iraqi forces. Speaking after the handover ceremony, Mr Miliband indicated there could be a decision on further British troop reductions within months. He said: "The prime minister made clear that, by March of next year, by the spring of next year, there will be about 2,500 British troops. We will have to make a decision then about the future." 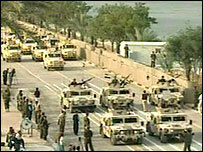 The handover prompted a parade of Iraqi troops in tanks and armoured vehicles through the streets of Basra. They will be responsible for controlling insurgents in the area. Questioned later by Iraqi journalists, Dr al-Rubaie made clear that UK forces would no longer be able to carry out military operations without being asked. Such requests would have to be approved by the governor of Basra or even the Iraqi prime minister Nouri Maliki. Dr al-Rubaie, who insisted the security forces were acting to stem the flow of weapons and foreign fighters into Iraq, said: "(British troops) would step in and help when they are called on to do so regarding security." Dr al-Rubaie also revealed he was expecting to see around 17,000 prisoners and detainees go free nationwide in the coming months. "Twenty-six thousand prisoners are being held in multi-national and coalition prisons now," he said. "There is a plan currently being looked into by both sides to release a lot of those; approximately two-thirds will be released." The governor of Basra, Mohammed al-Waili, said he wanted to create "an arms-free city". Mr Miliband told the BBC there had been a "massive" reduction in insurgent activity in the last six months, although "common criminal violence" still needed to be addressed. And he said Iraq was still a "very, very violent" place, adding: "We are not handing over a land of milk and honey. "Our troops retain the capacity to intervene again should there be a breakdown of order." Basra is the ninth of Iraq's 18 provinces to resume responsibility for its own security and the fourth to be handed over by British forces after Muthanna, Maysan and Dhi Qar. In a poll of 1,000 Basra residents for BBC Newsnight, more than 85% said they believed British troops have had a negative effect on the Iraqi province since 2003. But two-thirds thought security would improve following the handover. Col Bob Stewart, former British commander with UN forces in Bosnia, told BBC News 24 that Britain's only real achievement in Iraq had been to remove Saddam Hussein from power. "We've got rid of Saddam, but we haven't given the Iraqis a great life," he said. "If you were to actually grade it, one to 10, from the point of view of someone who lives in Basra... probably we would score it about three." Three months ago, British troops pulled back from Basra city to their airport base. But the acting Liberal Democrat leader Vince Cable has questioned the need for the 4,500 British troops to remain in Iraq now their role has been downgraded. "The Government should set a timetable to bring all British troops home from Iraq." Scottish National Party defence spokesman Angus Robertson said the handover served as a reminder of the "dreadful cost and calamity" of what he called "Blair and Brown's misguided mission". Meanwhile, reports say al-Qaeda's second-in-command, Ayman Al-Zawahri, has claimed in a video posted on the internet that the handover of Basra to Iraqi control was proof that insurgents are gaining the upper hand.